This fantastic 3 bedroom Penthouse is located near the heart of the up-market Sotogrande Marina complex with its many restaurants and bars. 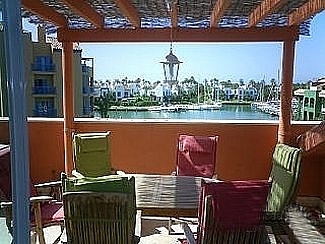 The apartment commands views over the marina of Sotogrande and is ideal for outside living. It has its own private rooftop Jacuzzi, dining area, complete with large gas barbecue. The apartment is fully equipped and furnished to a high standard, all floors are covered in cream and rosa marble. The large through living/dining room has glass patio doors leading to the terrace. There are three large cream leather sofas as well as a coffee table and a working fireplace. There is also a natural wood dining table with seating for six. For your entertainment we have a flat screen TV, English satellite, DVD player, with a CD/radio stereo system. As you would expect the kitchen is very modern with beech and stainless steel units. The equipment includes: built-in oven with timer, microwave, large fridge/freezer, ceramic hob, dishwasher, washing machine, tumble dryer. Fully equipped with cooking utensils, juicer and electric mixer. Full china/glassware for 6. There is use of private pool and changing rooms - accessed with key. Paking consists of underground car parking for 2 cars. Finally mooring available directly in front of apartment (at additional cost).